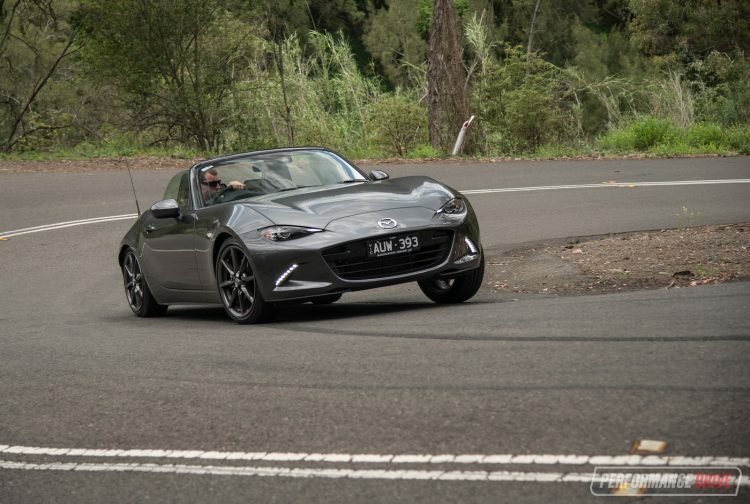 Mazda wants to ensure its MX-5 remains as one of the best fun-for-your-buck driver’s cars on the market by introducing a mild update for the ND model. 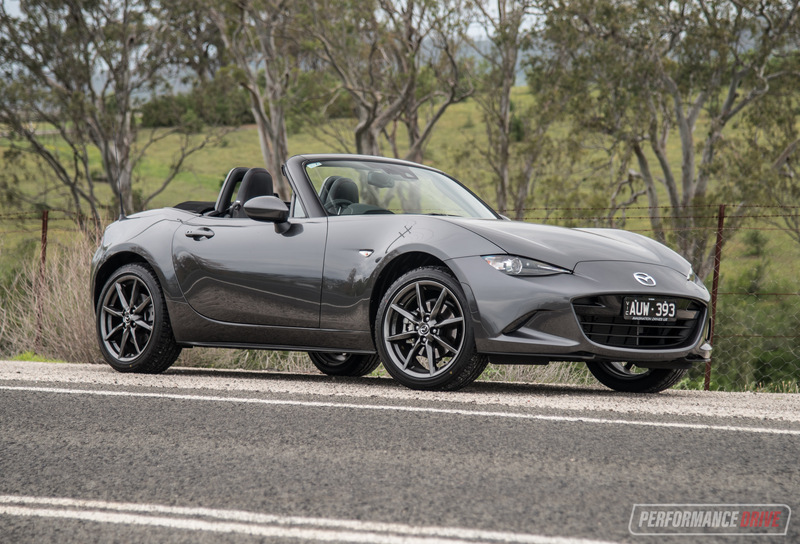 It comes in as the most powerful non-turbo MX-5 to ever hit the market. Yes, the humble MX-5 wants to be taken more seriously. The 2.0L model is now more powerful than ever before, with outputs lifted from 118kW and 200Nm to 135kW and 205Nm. That doesn’t seem like much but considering the tare mass of the manual version is just 1010kg, you can begin to appreciate the awesome power-to-weight ratio on offer. Some other revisions are also applied but we’ll go into them later on. Prices haven’t really changed that much, with only minor increases in some areas. However, the biggest change is to the lineup in general. It has been streamlined. 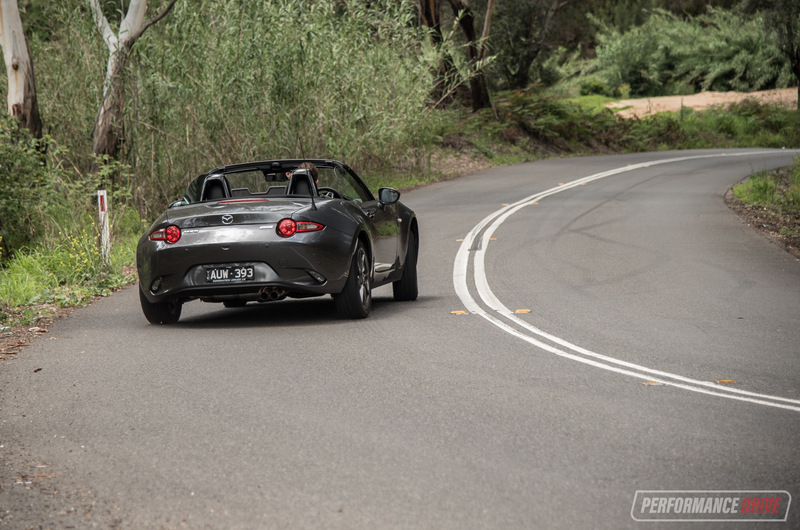 For example, the Roadster is only available in GT form as opposed to non-GT form as well. There’s also now just two variants of the 1.5L engine option. The changes seem like a natural evolution for the range, helping customers sift through to find their preferred choice. The opening price is now $34,190 for the base 1.5L compared with $33,440 of the previous model. This Roadster GT manual variant we have here starts from $41,960 (up from $41,210). It doesn’t take you long to appreciate the design and build quality of Mazda interiors of late. 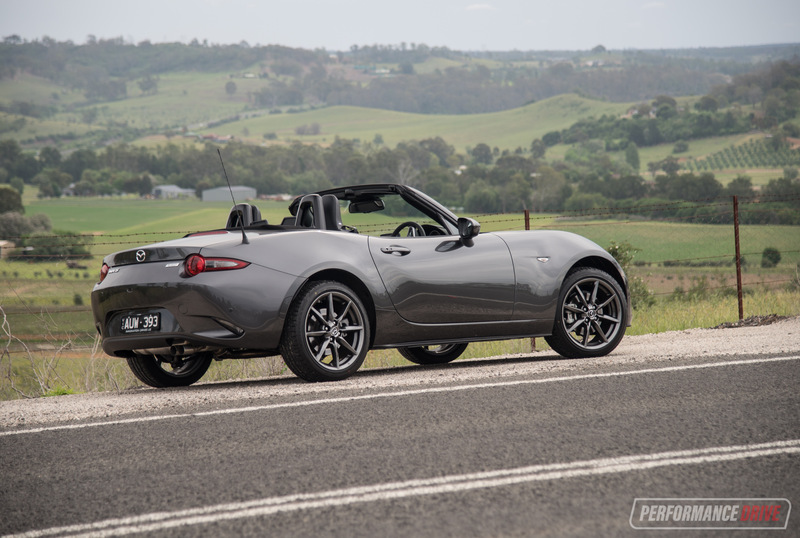 There aren’t any major changes to the 2019 MX-5 over the 2018 model, and indeed the 2015 model when the ND shape debuted. But we think it still fits in with the times, showcasing a modern, sporty, and somewhat suave decor. 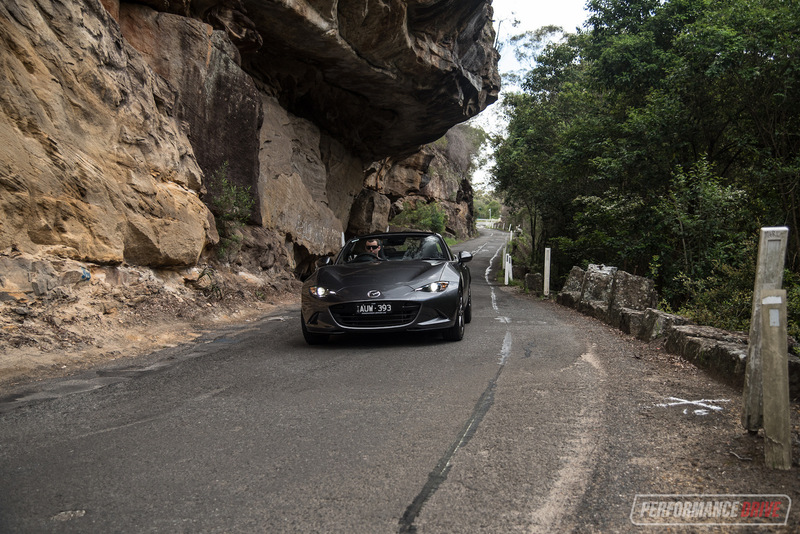 If you’re considering an MX-5 because you want an intimate driving experience, at one with the car and all that, the MX-5 fulfils that desire. In fact, desire will likely be overflowing as the cabin is quite confined. 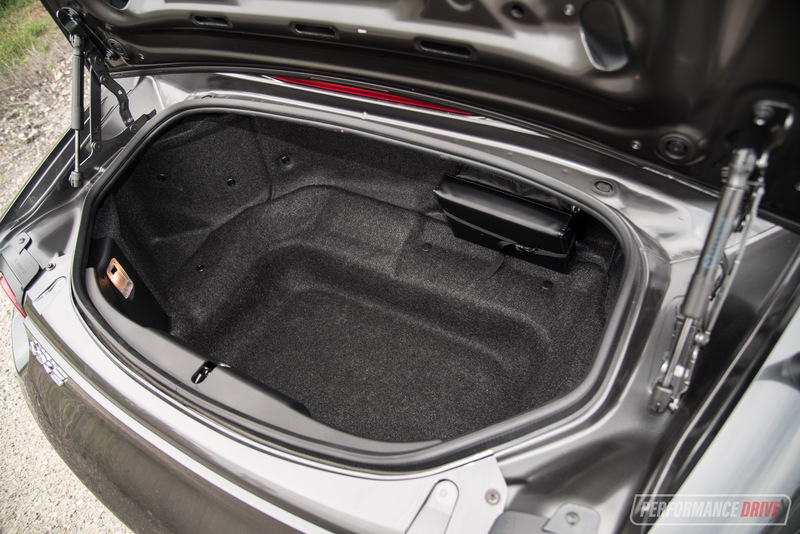 There is very little space to move about, and storage is restricted to a cavity in the rear bulkhead, behind the centre console. A pair of detachable cup holders are fun, but they aren’t capable of holding anything taller than a coffee mug. The driving position is very snug and yes, very intimate. You really feel like you’re connected to the car. In fact, it feels like you make up a structurally-integral element. The steering wheel faces your chest perfectly, with well-placed pedals and a short-throw gear shifter falling right into your hand. 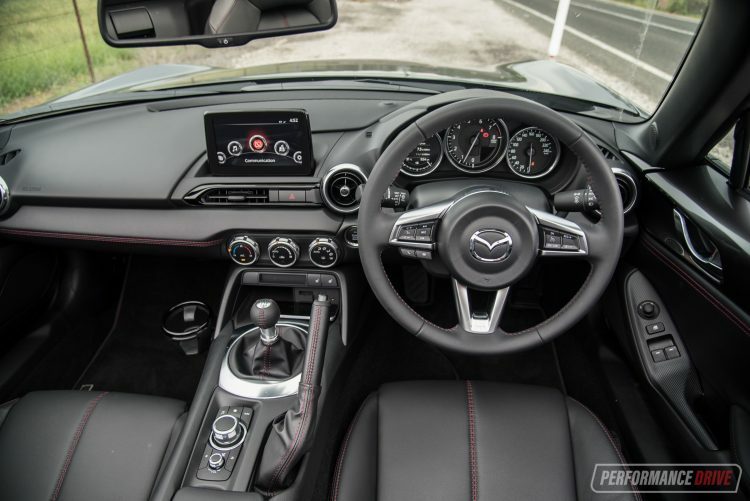 Most of the interior functions are very much in the foreground, and the fantastic MZD Connect hand controller is mounted on the centre console for further convenience. There’s also a manual handbrake (pretty rare these days), and a nine-speaker Bose stereo tucked away somewhere in amongst it all. 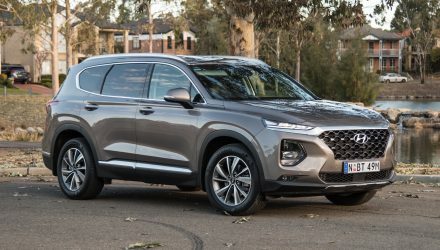 So, what’s new for the 2019 model? 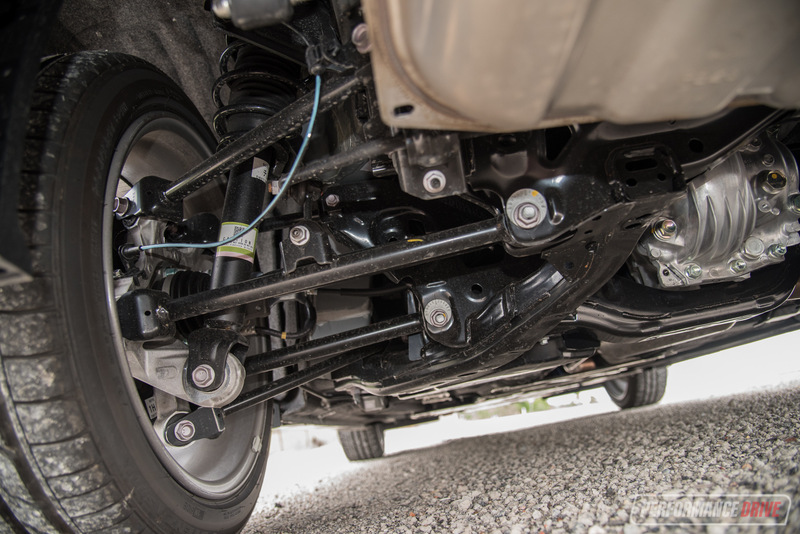 Well, one of the best changes is the fitment of a rack and reach adjustable steering column. This was previously only rake, which made getting comfortable all the more challenging. 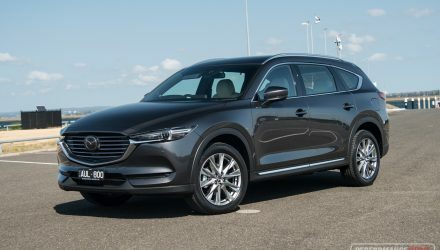 Mazda says the cup holders have been reinforced so they are sturdier, although we think they are still a bit flimsy and useless for large bottles and cups. Some new seat adjustment levers have also been implemented for a more robust feel, and a rear-view camera is now standard across the board. 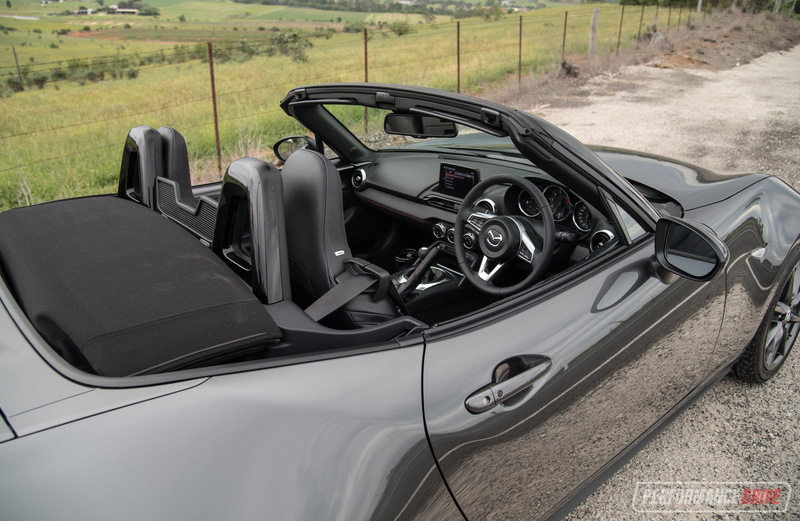 Speaking of safety, the 2019 MX-5 comes with Mazda’s i-ActivSense safety suite which includes autonomous emergency braking and traffic sign reading technology as standard. 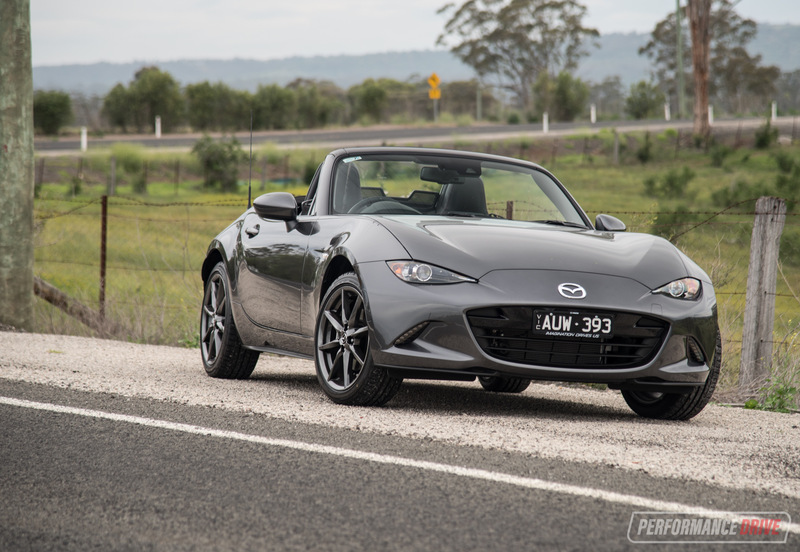 The 2.0-litre four-cylinder engine now offers the perfect amount of grunt for the MX-5. Before there were times where you might ask for more power. But now, it’s absolutely spot in. The extra muscle essentially comes from the ability to rev higher. Peak power is now achieved at 7000rpm as opposed to 6000rpm before. The redline cutoff is extended from 7000rpm to 7500rpm, too. This means you can really wring it right out and enjoy the high-revving character, traditional of a classic roadster. 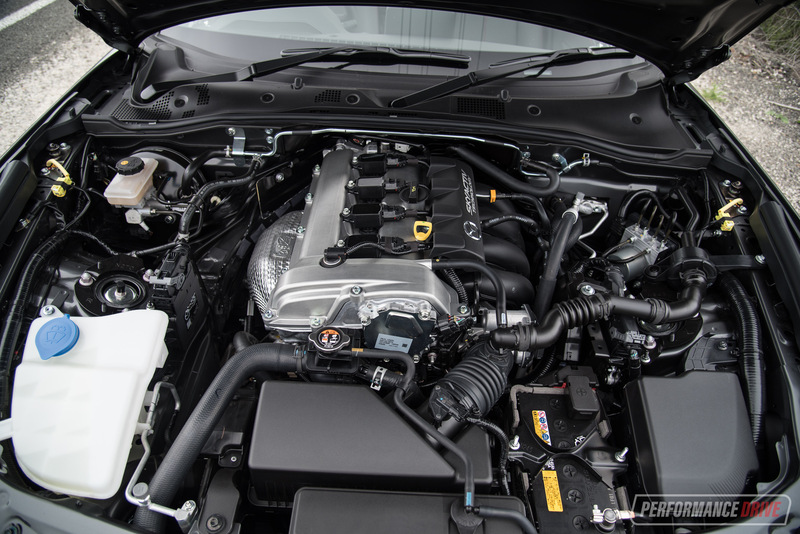 Specifically, the new engine features a revised air intake and exhaust system with a throttle body size similar to that of a 2.5L engine. Inside the block are new pistons with reshaped tops and reduced weight (27gm lighter), an updated crank and lighter conrods (41gm), and revisions to improve combustion speed. A high compression ratio of 13:1 remains, along with variable valve timing. 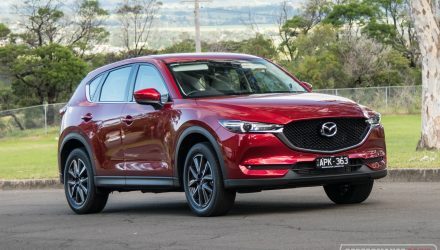 Mazda says the throttle response has been sharpened as well, partly thanks to a new dual-mass flywheel replacing the previous single-mass setup. Jumping from 118kW to 135kW might not seem like a big jump, but you do notice the difference. Peak torque is now available at 4000rpm, down from 4600rpm. 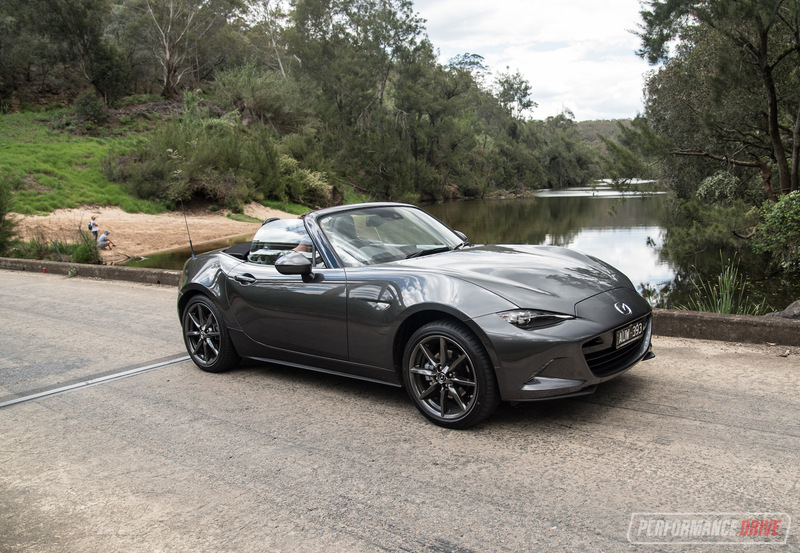 Along with an extra 5Nm, the MX-5 is less likely to labour and bog down in higher gears. Driving through roundabouts in third gear is no longer an issue. Not that it was a major issue before. It simply pulls more freely and effortlessly than before. And, as mentioned, you can now stretch its legs right out to 7500rpm. Changes to the muffler also help to produce a nicer note, while the exhaust in both the two-pipe and four-pipe areas of the manifold feature larger diameters which help the engine breathe more freely. It doesn’t sound like a classic, twin-carb roadster of yesteryear, but it does produce a decent little roar and rasp, especially at low and high points in the rev range. Take a listen in the video below. 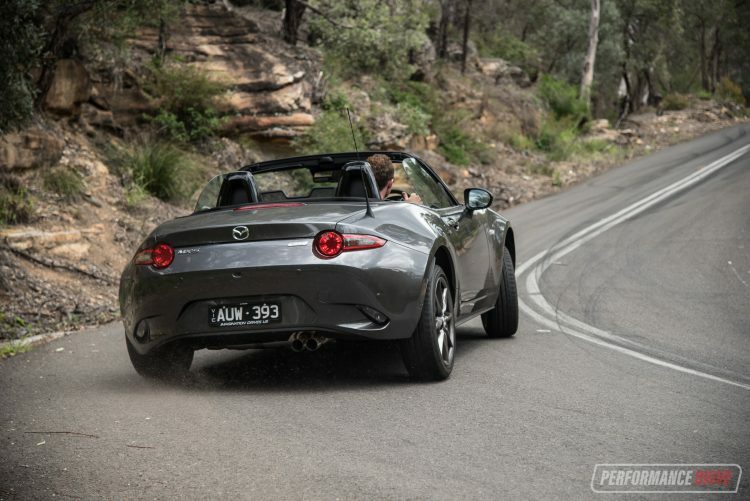 Around corners the MX-5 is just sublime. This is definitely a car that encourages you to get up early on a Saturday or Sunday morning just to go for a drive. 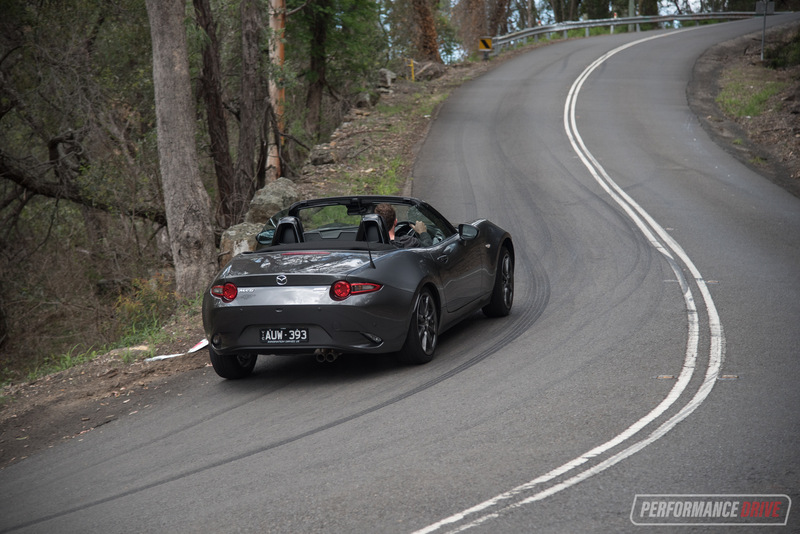 With the roof down is the best way to fully enjoy its driving dynamics. You can lean it into corners at a leisurely speed, or, aggressively tip in with a higher-tempo attitude. In either case, it’ll provoke a big smile. 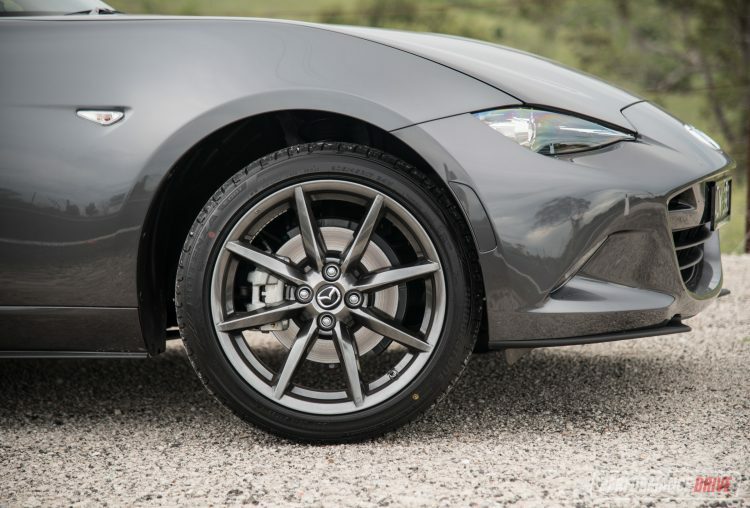 Turn-in is sharp but not too fidgety as you work that beautiful three-spoke steering wheel to perfection. Jumping on the gas early in the corner, such as just before the apex, will incite a kick of oversteer. Alternatively, you can trace around the optimal driving line and apply power gradually for an extremely rewarding experience. This car offers a wide breadth of ability that can be appreciated across all driver types and skill levels. And because you’re so low to the ground, with the wind in your hair, every journey is thoroughly entertaining. 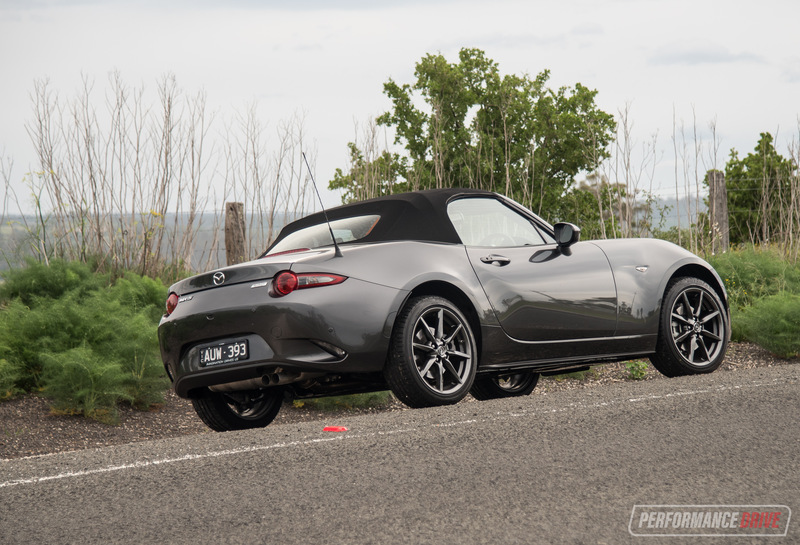 If there was any area we’d change about the new MX-5 it’d be the suspension. It is on the soft side, for sports car. The body leans and the front end can feel a touch wobbly under certain demands. 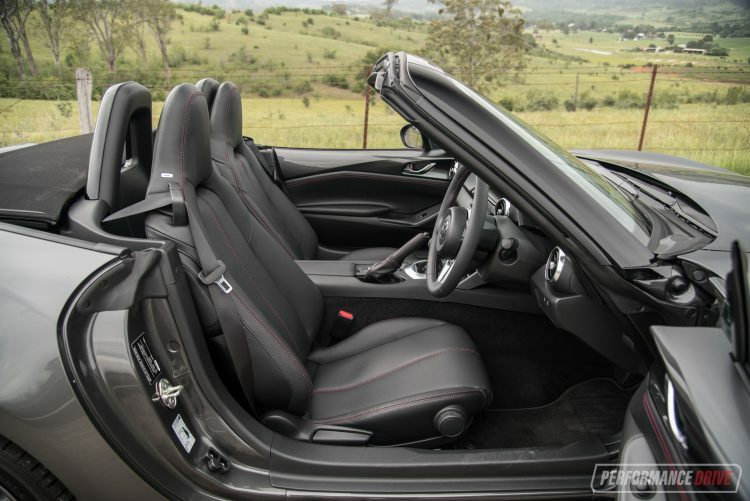 Obviously this comfort setting broadens its appeal by reaching out to a wider audience, ensuring the MX-5 is as versatile as possible. 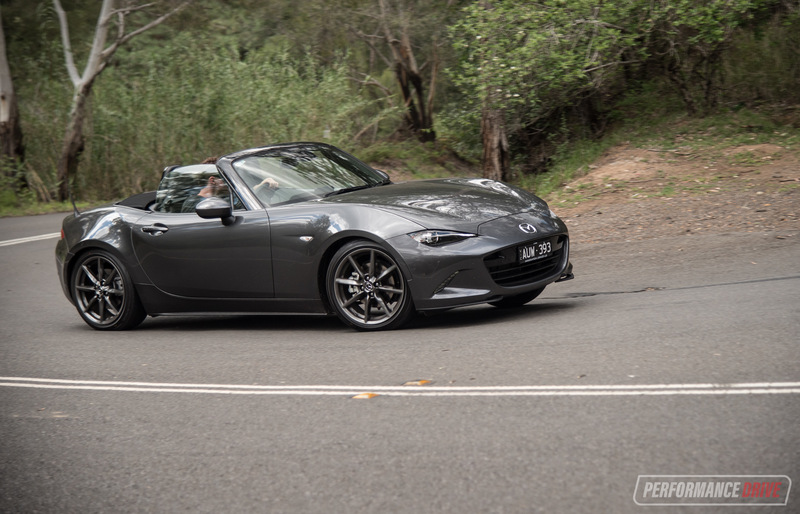 However, earlier in the year Mazda offered a special edition MX-5 with Bilstein suspension. We think it would be cool if this setup was offered as an option for the keener enthusiasts. As you’ve probably guessed, we’re just trying to find a flaw in an otherwise outstanding product. With the extra power the MX-5 becomes a brilliant driver’s car – not that it wasn’t before the update. Our acceleration timing saw a best 0-100km/h sprint in just 6.8 seconds. This means it’s quicker than its arch nemesis, the Toyota 86/Subaru BRZ, of which we’ve timed on the same strip of tarmac in the 7.4-second region. 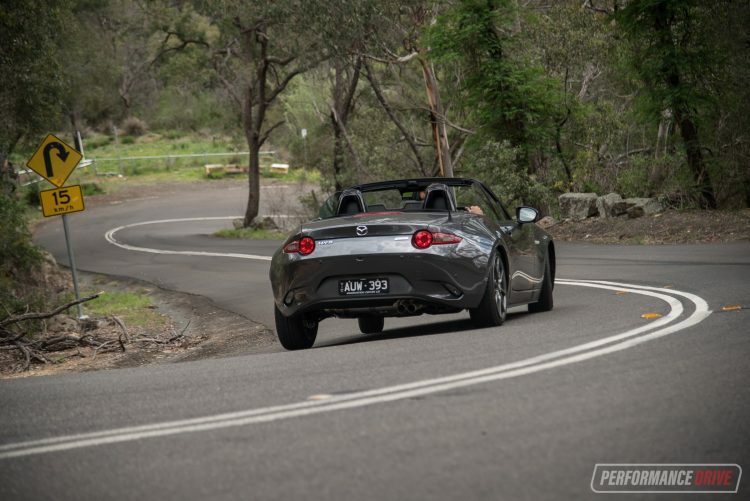 With a higher rev limit, the MX-5 aligns more accurately to the classic roadster formula. As a bonus, the real-world fuel economy you can expect to achieve here is unbelievable. 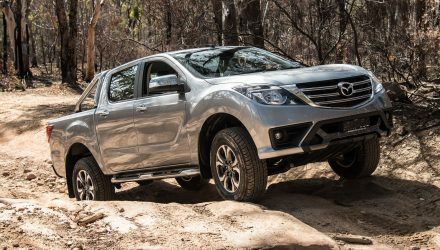 During our week of testing, including performance runs and plenty of mountain drives, the freshly-reset trip computer displayed a week-average of just 7.0L/100km. This is just off the official average of 6.8L/100km. 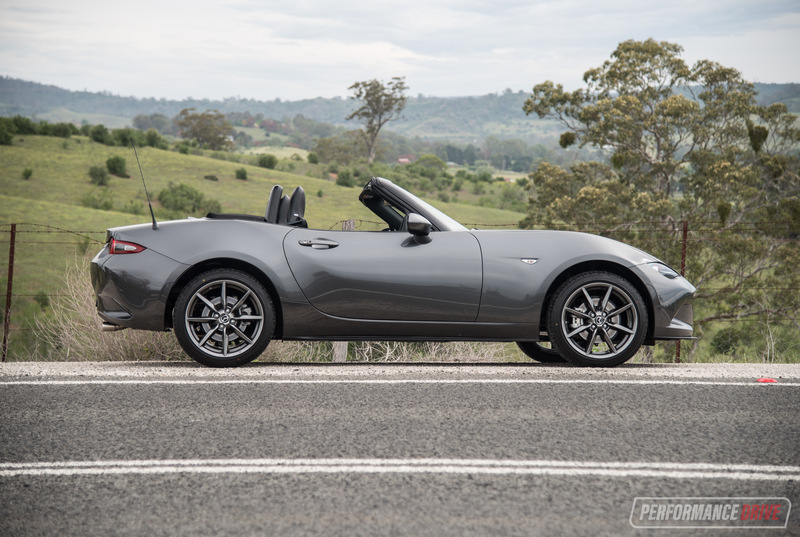 If you’ve always wanted to buy a sports car and loved the idea of the MX-5, you need to get into a Mazda dealer and take one of these little machines for a test drive. It’s a hoot.